UPDATE: Temperatures have turned quite cool (49F) in Moscow and showers in Pakistan become more scattered as the persistent block broke down. Raging wildfires in western Russia have reportedly doubled average daily death rates in Moscow. Diluvial rains over northern Pakistan are surging south - the UN reports that 6 million have been affected by the resulting floods. According to meteorologists monitoring the atmosphere above the northern hemisphere, unusual holding patterns in the jet stream are to blame. As a result, weather systems sat still. Temperatures rocketed and rainfall reached extremes. Renowned for its influence on European and Asian weather, the jet stream flows between 7 and 12 kilometres above ground. In its basic form it is a current of fast-moving air that bobs north and south as it rushes around the globe from west to east. Its wave-like shape is caused by Rossby waves - powerful spinning wind currents that push the jet stream alternately north and south like a giant game of pinball. In recent weeks, meteorologists have noticed a change in the jet stream’s normal pattern. Its waves normally shift east, dragging weather systems along with it. But in mid-July they ground to a halt, says Mike Blackburn of the University of Reading, UK (see diagram). There was a similar pattern over the US in late June. Stationary patterns in the jet stream are called “blocking events”. They are the consequence of strong Rossby waves, which push westward against the flow of the jet stream. They are normally overpowered by the jet stream’s eastward flow, but they can match it if they get strong enough. When this happens, the jet stream’s meanders hold steady, says Blackburn, creating the perfect conditions for extreme weather. A static jet stream freezes in place the weather systems that sit inside the peaks and troughs of its meanders. Warm air to the south of the jet stream gets sucked north into the “peaks”. The “troughs” on the other hand, draw in cold, low-pressure air from the north. Normally, these systems a constantly on the move - but not during a blocking event. See below, enlarged here. And so it was that Pakistan fell victim to torrents of rain. The blocking event coincided with the summer monsoon, bringing down additional rain on the mountains to the north of the country. It was the final straw for the Indus’s congested river bed (see “Thirst for Indus water upped flood risk"). 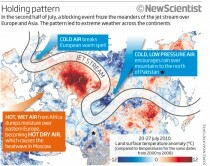 Similarly, as the static jet stream snaked north over Russia, it pulled in a constant stream of hot air from Africa. The resulting heatwave is responsible for extensive drought and nearly 800 wildfires at the latest count. The same effect is probably responsible for the heatwave in Japan, which killed over 60 people in late July. At the same time, the blocking event put an end to unusually warm weather in western Europe. Blocking events are not the preserve of Europe and Asia. Back in June, a similar pattern developed over the US, allowing a high-pressure system to sit over the eastern seaboard and push up the mercury. Meanwhile, the Midwest was bombarded by air from the north, with chilly effects. Instead of moving on in a matter of days, “the pattern persisted for more than a week”, says Deke Arndt of the US National Climatic Data Center in North Carolina. So what is the root cause of all of this? Meteorologists are unsure. Climate change models predict that rising greenhouse gas concentrations in the atmosphere will drive up the number of extreme heat events. Whether this is because greenhouse gas concentrations are linked to blocking events or because of some other mechanism entirely is impossible to say. Gerald Meehl of the National Center for Atmospheric Research in Boulder, Colorado - who has done much of this modelling himself - points out that the resolution in climate models is too low to reproduce atmospheric patterns like blocking events. So they cannot say anything about whether or not their frequency will change. ICECAP NOTE: These models are worthless on any scale or time frame. There is some tentative evidence that the sun may be involved. Earlier this year astrophysicist Mike Lockwood of the University of Reading, UK, showed that winter blocking events were more likely to happen over Europe when solar activity is low - triggering freezing winters (New Scientist, 17 April, p 6). Now he says he has evidence from 350 years of historical records to show that low solar activity is also associated with summer blocking events (Environmental Research Letters, in press). “There’s enough evidence to suspect that the jet stream behaviour is being modulated by the sun,” he says. 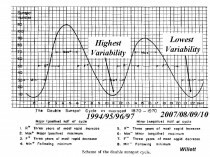 ICECAP NOTE: Hurd ‘Doc’ Willett of MIT presented at the 2nd Annual Northeast Storm Conference in 1978 a view of how the 22 year cycle affected weather patterns. His Hale Cycle work would have suggested the recent minimum 2007-2010 should be one of high “persistence” and thus low “variability”. This may have been augmented by the 106/213 year cycle concurrence. The patterns intraseasonally have been amazingly persistent since 2007. Willett passed in 1992. We are glad to see Professor Lockwood is back doing good science. See below, enlarged here. Blackburn says that blocking events have been unusually common over the last three years, for instance, causing severe floods in the UK and heatwaves in eastern Europe in 2007. Solar activity has been low throughout. It isn’t just heavy rain that is to blame for the current floods in Pakistan: water management has also exacerbated the risk of such events. Both Pakistan and India depend heavily on the Indus river for their water needs. Since independence in 1947 Pakistan has virtually doubled the amount of land it irrigates with Indus water and the picture is similar for India. This thirst for water carries a heavy cost. The Indus drains the Himalayan mountain chain and carries vast amounts of sediment. As more water is diverted into irrigation, the river flow has been severely reduced, and can’t now carry its accustomed cargo of sediment downstream. A growing number of levees and man-made channels also trap sediment on its way out to sea. “More silt has been deposited into sand bars, reducing the capacity of the river,” says Daanish Mustafa, an expert on Indus water management at Kings College London, UK. “There is no doubt that infrastructure has exacerbated the flood risk significantly. See the New Scientist story here.